The new year is a perfect time to reflect. It gives you the chance to celebrate where you succeeded, scrutinise where you could improve and look at how you could shake things up for the next year. For ecommerce, the past year proved difficult. Retails were faced with seemingly impossible odds, having to compete with the likes of Amazon and hundreds of small businesses entering the marketplace every day. On top of this, discount days forced many stores to slash prices and sacrifice profits. The difficult to navigate ecommerce landscape presented challenge after challenge and many independent retailers felt that they couldn’t compete. But, as ecommerce continues to transform, new trends are emerging. With an inundation of choice and technology available, customers have more purchasing power than ever. Price and logistics are no longer the priority. Instead, optimising the customer experience is where success and opportunity arises. In 2019, store owners need to adapt to the changes. 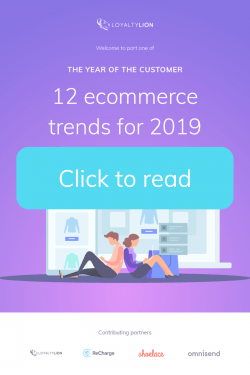 We’re excited to share our ebook, The year of the customer – 12 ecommerce trends for 2019, that brings together insights from 11 of our technology partners. Each chapter is packed full of success-driven, actionable strategies that ecommerce stores can, and should, implement in 2019 to respond to the changing retail ecosystem. Part one includes expert insights from LoyaltyLion, ReCharge, Shoelace and Omnisend. Each partner shares exciting trends in customer loyalty, subscriptions, retargeting and email marketing that retailers should take advantage of in 2019. Part two presents contributions from Shopify Plus, Okendo, Brightpearl and LimeSpot. Chapters explore trends across customer experience and actionable strategies to improve on-site performance. And, finally, part three features Gorgias, Justuno, Searchanise and Klarna. Our partners discuss customer service, site search and alternative payment strategies that will elevate your store in 2019.